Honey, Dinner’s Cold! | What Goes with What? Well it’s begun, that email, that phone call, “…so we’re going to be in wine country…..”, yes, it’s visitors. We had three couples come calling within ten days of each other recently and we had to feed two of the three, my little secret – we served the same meal twice, mostly because it was really good and the second time it was just really easy – and still really good. Hint when you come by don’t ask if anyone else has been here recently. I get the “you’re always in the kitchen when people come for dinner” song all the time, funny then why don’t we order out. So I wanted to make a complete meal that was all done ahead of time and served cold, OK room temp, so we could sit out on the deck with the friends and eat and drink wine together. The menu was a success and really is a tasty way to go. For the appetizer I did Crab and Avocado Toasts, salad was Tomato’s Marinated in EVOO with herbs and then surf and turf, Salmon Fillet Marinated in EV Olive Oil, Tarragon and Mustard along with slices of Beef Sirloin Roast with Garlic, Kosher Salt, Black Pepper and Fennel Rub and a mustard and mayo sauce on the side. “Chocolate” was my answer when the “What can we bring?” question came up. You will find all of the recipes at the end of the Whine, but now on to smokin’ and drinkin’. Topical note; Coincidently to the seminar a story in the paper about a grower being raided at gun point by some obscure county agency to supposedly check on whether the growers water source was legal. This took place after the grower had filed paperwork with the county for all the permits and so forth to do business, legally. They lost a potential crop worth $350,000. 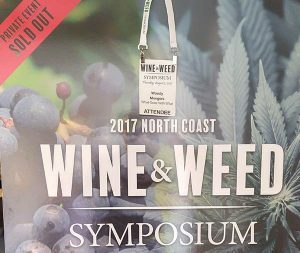 It also appears that the weed folks have far more to gain by associating themselves with the highly, yet well-regulated and well-accepted wine industry, than wine has to gain by associating itself with weed and they (wineries) need to be very careful since wine is fully regulated by the feds – not so much for the weed folks. Assumed factoid – outside of the medical uses of cannabis, there is no other reason to consume it other than to get high. To that end I heard Claudio Miranda of Guild Enterprises say (that), “…one difference between the two products is that wine is never promoted by touting its ability to bring on inebriation nor by the types of inebriation it induces. Cannabis, on the other hand, is promoted almost exclusively in this manner”. The cannabis industry will affect the wine and beer industry immediately and that affect will grow over time as people choose to take the edge off with a joint rather than a Pinot Noir or a Lagunitas and it will, over time have an impact on the cost of production and what a bottle costs you when it gets to your local wine shop, assuming that you will still have a local wine shop with Amazon now providing two hour deliver of wine and liquor in many major markets. Preheat the oven to 350 degrees; and lightly brush a large baking sheet with olive oil. Using a 2-inch round biscuit cutter, stamp 4 rounds out of each slice of bread and transfer to the baking sheet. Lightly brush the rounds with olive oil and toast for about 15 minutes, until they are lightly golden and slightly crisp. Or…lightly toast the bread and then cut the rounds or squares if you like and then just a tad of OO. 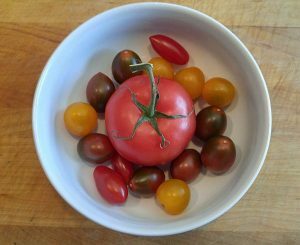 Cut the tomatoes into 4 wedges, then cut the wedges in half and add to a bowl. Lop off the tops of the green onions then slice the white and mostly light green parts really thin. Add to the tomatoes. Add the olive oil, balsamic vinegar and brown sugar, dash of salt and pepper to a small bowl and whisk to blend. Pour the dressing over the tomatoes and toss. Add the herbs and gently toss to combine. Cover and refrigerate for a couple of hours before serving! The salmon is so good and even better after a day or two and makes great leftovers and a nice lunch salad with a bit of mayo and mustard. I suggest a Costco trip to get a good large skinless piece, you won’t be sorry. Preheat the broiler and position a rack 6 inches from the heat. 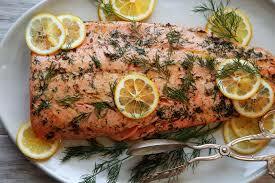 Scrape the marinade off the salmon and transfer it skin side down to another large rimmed baking sheet. Season with salt and pepper. Broil the salmon for about 8-10 minutes, until an instant-read thermometer inserted in the thickest part of the fillet registers 125 degrees; Let the salmon rest for 10 minutes, then transfer it to a platter. Serve with the mustard sauce. The mustard sauce can be refrigerated overnight. Drink: A bright flavored Pinot Noir with some cherry fruit is great with the salmon and a bit of smoke and mustard, I’m hungry. I love to serve this roast cold as well as hot and if you want to serve cold it will be best to cook the day before and allow it to chill overnight. A simple mayo and mustard sauce is terrific with this, recipe follows. Stick a few garlic cloves in the roast. It adds a nice flavor right through all the meat. 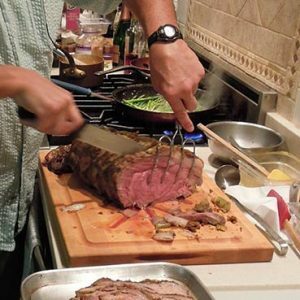 Simply, use a paring knife to spear into the roast about 1 1/2 to 2 inches. Press a garlic clove into each of the slots in the meat. For a 5-6 pound top sirloin roast, I use 6-8 garlic cloves. Rub the roast with some olive oil then rub the seasoning all over the roast. salt, cracked black pepper, thyme and oregano, fennel all blend to give the perfect seasoning for the roast. Preheated your oven 450F. Place the meat on a rack in a roasting pan and cook uncovered for 15 minutes at 450F. Then, without opening the oven door, turn the heat down to 325F. Now, cook the roast until the internal temperature of the meat is 120F. Remove from oven and tent with foil and maybe even a dish towel. Let it rest for 20 minutes and temp will come up to 125 degrees for a medium rare roast. For a 5-6 pound roast I find the total cooking time is around 3 hours. But, every oven is different and roasts vary in weight and shape, so instead of cooking for a certain length of time, it is much better to use an instant thermometer to check at the end of cooking time or even better a probe type that sends the temp to a remote reader so you know when it’s really done. At this point if serving cold cover the roast and chill, overnight is best, then thinly slice and maybe roll each piece and plate for service. Wine match: Cold beef takes on a different taste profile than warm and if you’re using the mayo & mustard sauce, a full bodied Pinot Noir with work nicely with this roast. Serving warm with a nice mushroom sauce, I’d look to Merlot. The bottom of the roasting pan will have a lot of beef juice and fat, perfect for making gravy. Pour the juices into a glass measuring cup or a degreaser pitcher if you have one, then add a bit of water or wine to the pan and heat on a burner to deglaze, hold until you remove the fat from the juices and then add together. Use this as your base for a lovely gravy, or sauce.